Serenity Now: What Have YOU Been Up to Lately? The Show Me the Progress party will be here before you know it! Are your calendars marked for Wednesday, March 10th? The party will go live on Tuesday night around 10 pm (ET) and I'll keep it open until Thursday evening. I have a wee little Giveaway contest/drawing for the participants this time around. 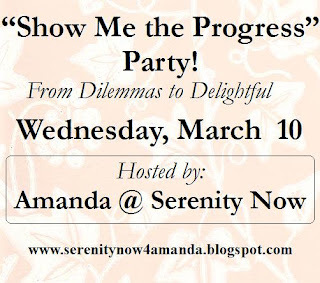 You do NOT have to have linked to a Decorating Dilemmas party to participate in Show Me the Progress. I originally planned this as a way for those who have linked to DD to share their updates, but I think it would be fun to read about the progress you're making in any area of your life (weight loss, cleaning up clutter, a book list, meeting a work goal, finishing a craft project, you name it!). Remember...you don't have to have a complete, finished Delightful "After" photo to link up. Progress can be anything as small as listing the ideas from Decorating Dilemmas comments you received that you really liked and want to implement. Or, tell us your plan for your Dilemma and show us a photo of the supplies you're planning on using. Halfway done with the transformation? That's okay...we want to see and be encouraged! Amanda, I do have this date marked on my calendar, and I'm looking forward to it. I think this is a GREAT idea for a party. And you're smart to open it up even further here. So often we get hung up on having only the finished product to celebrate. . . but progress is wonderful! Progress is something to celebrate!! I have it on my calendar Ms. Amanda! I'm hoping I'll be able to share some patio stuff!! Gotta get busy. Also, when is the next Decorating Dilemmas party? I've got my next trouble spot ready to go! Can't wait! You are like THE blogging queen! I don't know how you do it Missy!! yeah, so i'd totally do this with weight loss because i've never worked so hard for ANYTHING in my life, but have no idea how to do what you're asking...lol!! esp posting pics, since i don't blog. so, i'll just have to revel in the glow of my intrinsic motivation by myself. ;o) plus, i wouldn't want to appear TOO vain, huh? I will write up a post this weekend so that I can participate. It will be fun to see everyone's progress. I'm especially interested to see what you accomplished in your living room. I can't wait to see all the progress! As for my own, its beyond non-existent at the moment. I've been so bogged down w. work I've had no time to focus on my project. Maybe this weekend!